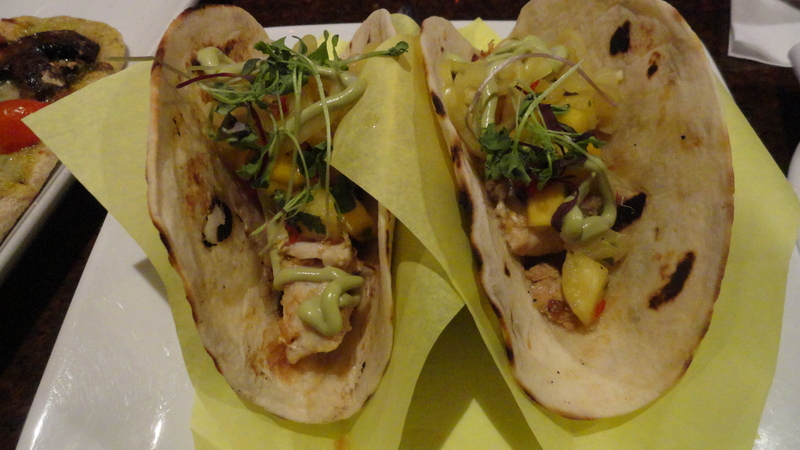 Nomad Lounge is a brand new lounge located in Disney’s Animal Kingdom Theme Park. It is situated in the same building as Tiffins which is also new. Tiffins is one of Disney’s ‘signature’ restaurants – the designation denotes it is one of their highest level of food and service that they offer. 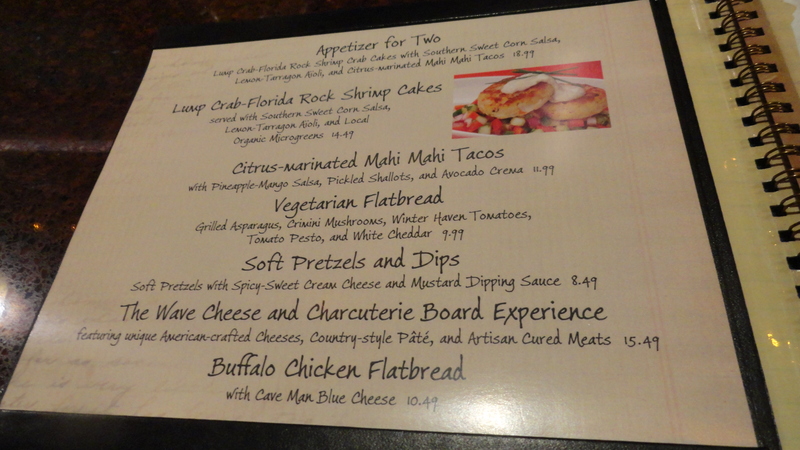 There are roughly 15 signature restaurants at Walt Disney World. 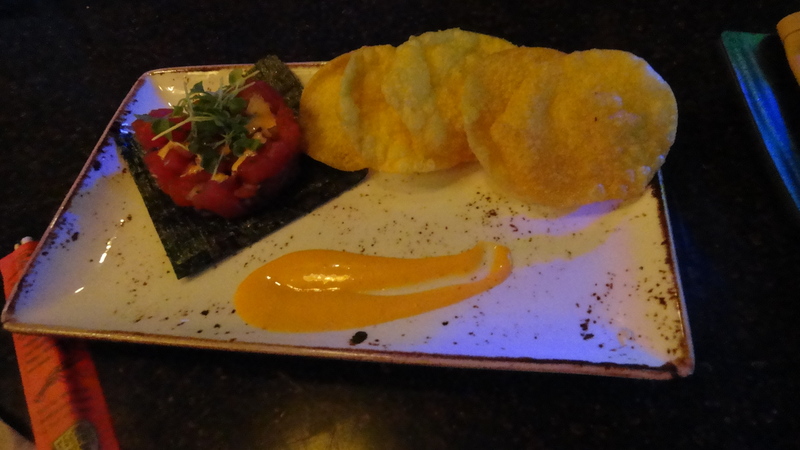 The Nomad Lounge offers high end nibbles and refreshments. The Nomad Lounge had an Adventurer’s Club type atmosphere, rich colors, dark woods, and unique decor gives it a British Colonial feel, slightly exotic – but also luxurious. It is open seating, both indoor or outdoor. I’m sure the outdoor seating will be very nice once the weather cools off, right now there are too many mosquitoes. We ordered the vegetarian summer rolls and the cheese board. These were really delicious, but very hard to eat. When they cut them in half like this, they are hard to hold together, they just want to fall apart. The outer wrapper is very chewy, be careful eating it. This was slightly spicy, the ponzu sauce was really complementary. The cheese selection was very nice. The chunky yellow one was an aged cow cheese, reminded me of cheddar. The white one on the left was a goat cheese, very mild though which was perfect for my taste, I don’t really like strong goat cheese. And the white one in the middle back was a tangy blue cheese. A small portion of marcona almonds, toasted bread (very crisp), and a gooseberry for accompaniments. If you are a fan of Sam Adams Winter Lager, you will probably really enjoy this Kungaloosh Spiced Excursion Ale, it has some unique spices and nutty finish. It went really well with the food. Keep in mind the portion sizes are small, prices are a bit high – this is pretty typical for any of the lounges, especially those adjacent to signature restaurants. They are taking the Tables In Wonderland card here (20% discount for members – http://www.tablesinwonderland.com). I’d say the best time to visit the Nomad Lounge would be around the last hour or hour and a half before the park closes. The crowd thinned out the later it got. I’d definitely go back and am also interested in trying Tiffins as well. My husband and I were in Orlando recently. We had eaten at a local restaurant for dinner and were thinking of what to do with the last couple hours of the evening, it was about 9 pm. Our choices were go to Animal Kingdom theme park which was open until 11 pm, or go to Magic Kingdom which was open until Midnight, and then lastly choose a resort bar (which usually close at Midnight as well). We decided on picking a bar, Sanaa seemed like a great choice. Once we got there we checked the bar menu, it was still early enough to order food from the bar menu, but we were still full from dinner. After a little consideration, we decided to try a bourbon flight. They also offer a tequila flight, if you are a tequila aficionado. For the bourbon tasting, you get three 3/4 ounce pours: the first one is the Maker’s Mark Wheated, then your choice of one Rye and one Straight bourbon. Their choices for Straight: Knob Creek Disney Select Single Barrel and Angel’s Envy Kentucky Straight. The choices for High Rye bourbon are the Woodford Reserve and Buffalo Trace Kentucky Straight. We started with one flight which comes with the Maker’s Mark Wheated, and chose the Buffalo Trace and Knob Creek Disney Select, only available at Disney. After we started tasting, we decided to just order another flight with the opposite choices so we’d be able to taste all 5 bourbons. The second flight had the Maker’s Mark again, plus the Angel’s Envy and Woodford Reserve. The Angel’s Envy was the harshest, it reminded me of a young whiskey, I drink Jameson at home, and it reminded me of that, it numbs the taste buds a bit. The Knob Creek Disney Select had a nice nose, pleasant and not too strong, the best nose of all the choices. The taste was complex. The Buffalo Trace was earthy and smokey smelling, tasted more mellow to than the Knob Creek. The Woodford Reserve had the most overwhelming nose, very strong. The Maker’s Mark Wheated was definitely the softest tasting, very nice, very smooth. After straight tasting, we added a bit of cold water and a small ice cube to each selection. 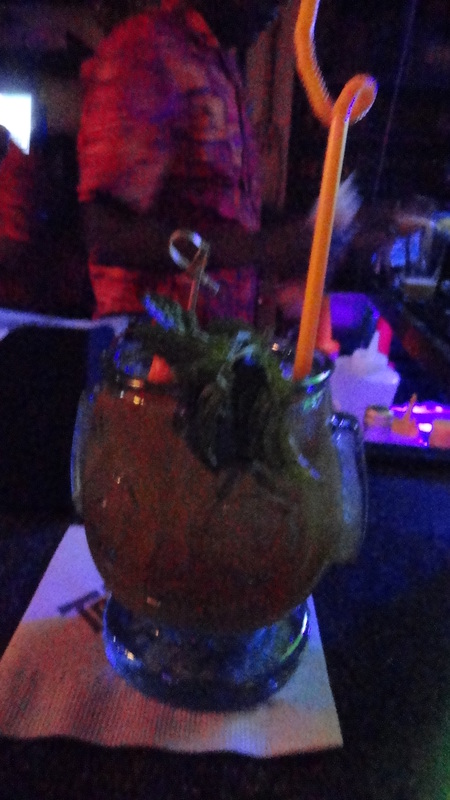 The most improved by adding water was the Angel’s Envy, followed by the Woodford Reserve. It took away a bit of the harshness, definitely would recommend doing your own tasting to see what preferences you have, also try with a bit of water. We spent about 2 hours just relaxing, it was really nice. Sanaa’s bar is open until midnight and it clears out after dinner ends, so you have a beautiful setting and not many people. The cost per flight was $13.50 not including tax or tip. It was well worth the cost for the experience, I could imagine doing a tasting activity at the Food and Wine Festival and it would probably cost quite a bit more. If I were to buy a bottle of bourbon for home, I’d probably choose the Maker’s Mark Wheated. It was fun to sample them all, and I feel like I’ve learned a bit in the process. If you ever get tired of the same old Disney vacation, try finding some of the smaller places on Disney property. Places like this, the Muddy Rivers Pool Bar, which is located on Ol’ Man Island at Port Orleans Riverside Resort at Walt Disney World Florida. This outside bar is great, it’s surrounded by trees and water, the bar is conveniently located pool side. What is great about visiting some of the out of the way places at Disney World is that they aren’t so crowded so even if it’s a Friday or Saturday night, most people are congregating in Disney Springs and the Theme Parks. When the weather is right, this outside bar is a perfect spot for relaxing. I ordered a frozen favorite – a Piña Colada, a mixture of coconut milk, rum, and pineapple. Price $8.75 before tax and tip. 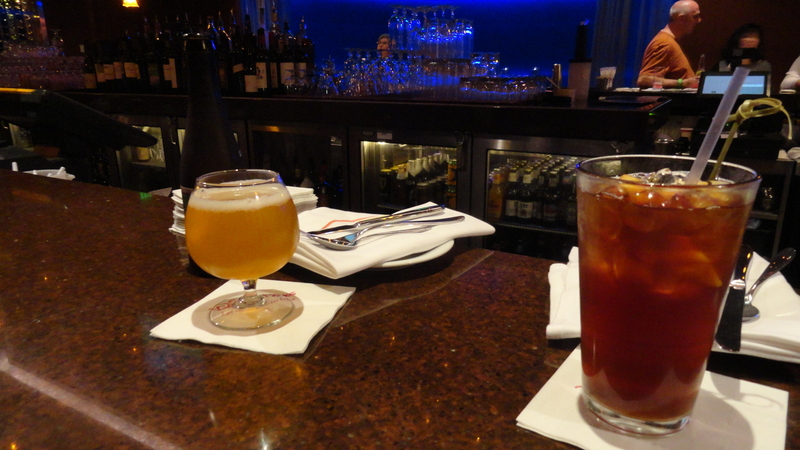 The River Roost Bar is located at Port Orleans Riverside Resort in Walt Disney World, Florida. On their menu they offer various cocktails, and they offer their version of the Sazarac, a classic New Orleans cocktail. This drink is made with high end Bulleit Rye American Whiskey, Agave Nectar, Bitters, and Pernod. While this wouldn’t be my drink of choice, I can certainly appreciate the history and culture behind this drink and that alone is a good reason to try it. It’s a strong drink, with slightly fruity undertones, and is an enjoyable drink ideal for sipping. Price $10.75 before tax and tip. If you haven’t noticed, we like to have appetizers as meals, we usually will pick one or two lounges and fill up on appetizers. Most of the time, like at The Wave or Raglan Road, you can easily get delicious and satisfying meals out of appetizers. If you aren’t able to find enough on one menu, the great thing about the monorail is that you can hop back on and head over to the next hotel and snack some more. Everything here was delicious. 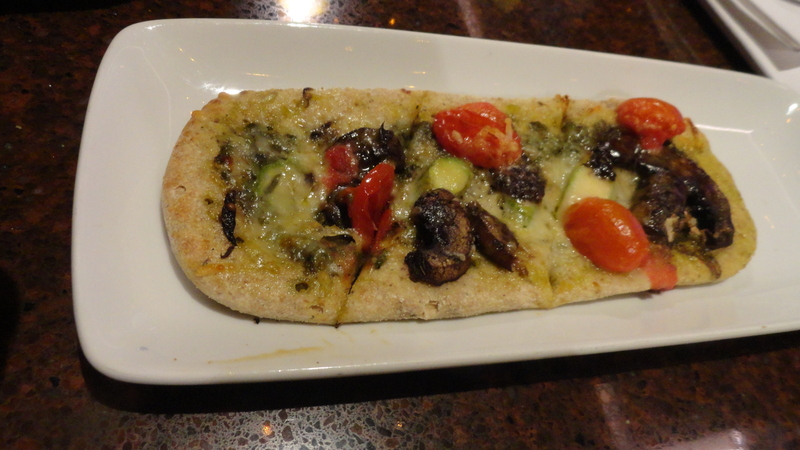 The only thing I wouldn’t order again was the vegetarian flat bread, it was extremely small for the price, not really a good value, I’d rather get something else next time. 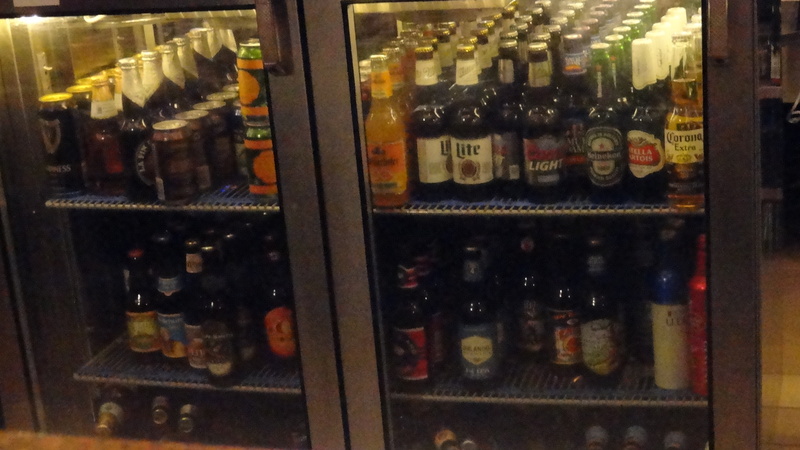 The have a few very high-end beers on their menu, prices can be a little shocking, if in doubt – ask first. 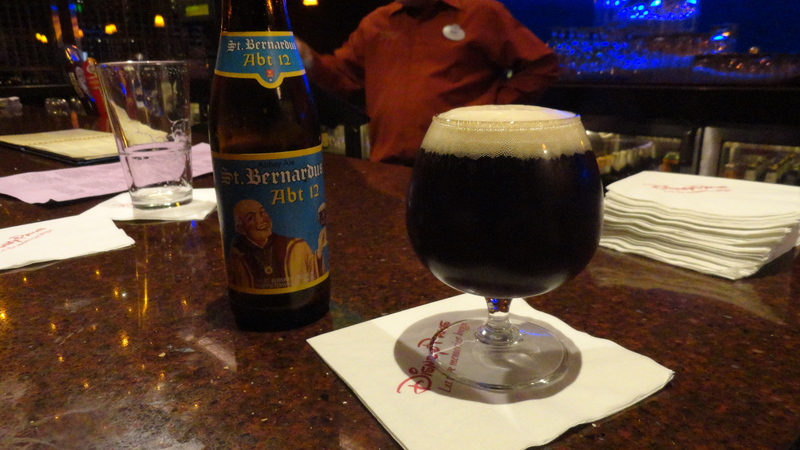 I believe the St. Bernardus Abt 12 was about $10. One of the best things about the Disney lounges is that you don’t every need a reservation. It is open seating, and they are usually not too busy. The bar here at The Wave is very comfortable to sit, eat, and drink; and the service was top-notch. 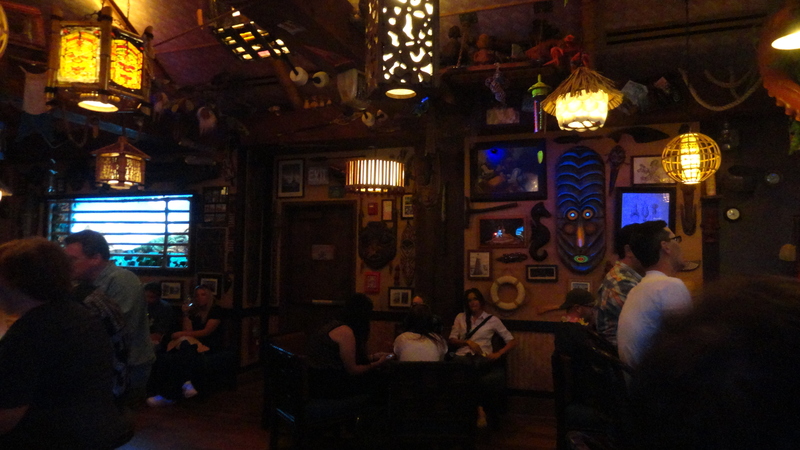 Perhaps one of the hardest place to get into on Disney property is currently the NEW Trader Sam’s Grog Grotto. Although it’s not officially open yet, they had a soft opening on 3/28/15. We decided to check it out Monday 3/30/15. 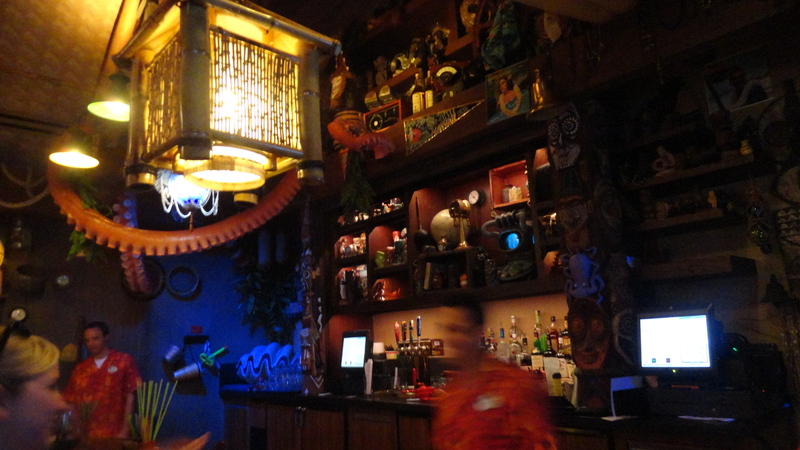 We got a pager quickly, however the wait time to get into Trader Sam’s was a little over 2 hours. This is probably going to improve considerably over time, however until the newness wears off, this is what you can expect. It was reported that on opening day, the wait time was 3 hours to get a pager, and then 3 more hours to get inside. A two hour wait is a considerable improvement, but keep in mind it was Monday; weekend crowds will probably be considerably larger. The place is actually quite small, very small, and seems even smaller with a lot of people inside. The capacity inside is capped at 50, I think there are at least 8 cast members inside, so in reality perhaps room for 42? That is speculation on my part, I didn’t take an actual ‘head count’ – hardy har, but there seems to be seating for about 40. Sadly, some of the bench seating is wasted space because there isn’t enough tables for people to sit across the whole bench. It was very loud inside, the cast members are required to perform/interact with guests according to what drinks are ordered. Each specialty drink ordered has a certain interactive effect. 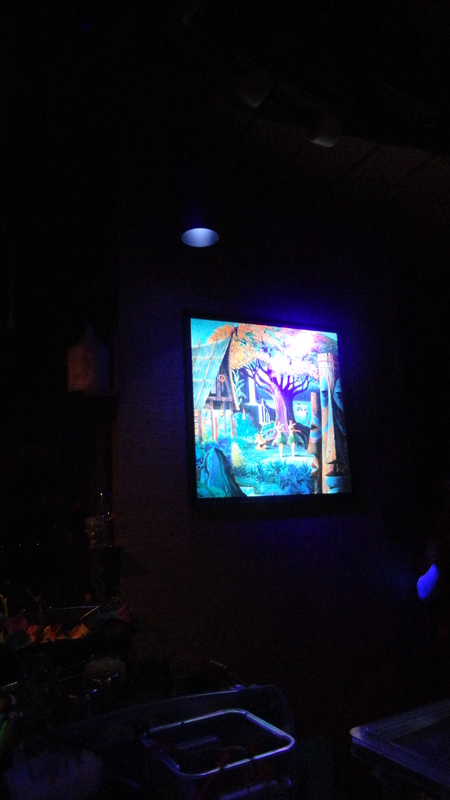 For instance if you order the Shrunken Zombie Head, the cast members cue the Shrunken Head effects, the black light comes on and illuminates the heads hanging in the rafters, some special music comes on. 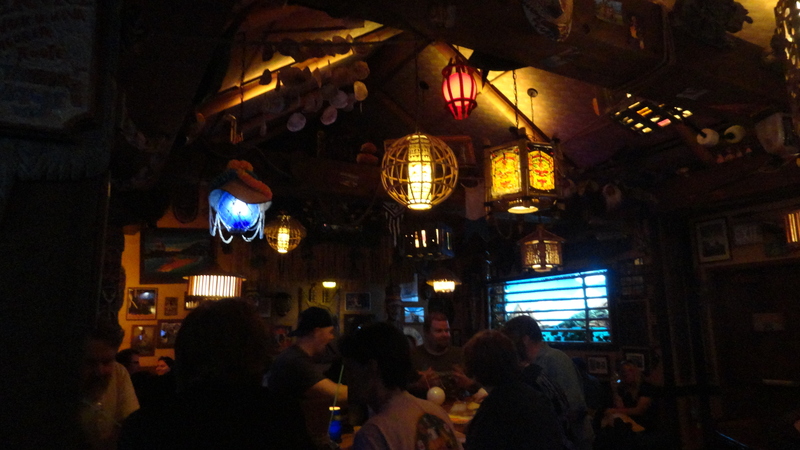 If you order the Polynesian Pearl, the bartender has to open and pull a pearl out of the giant clam at the back of the bar. There is more…best to see it for yourself. We ordered a Tuna Poke, which was delicious, but really small. 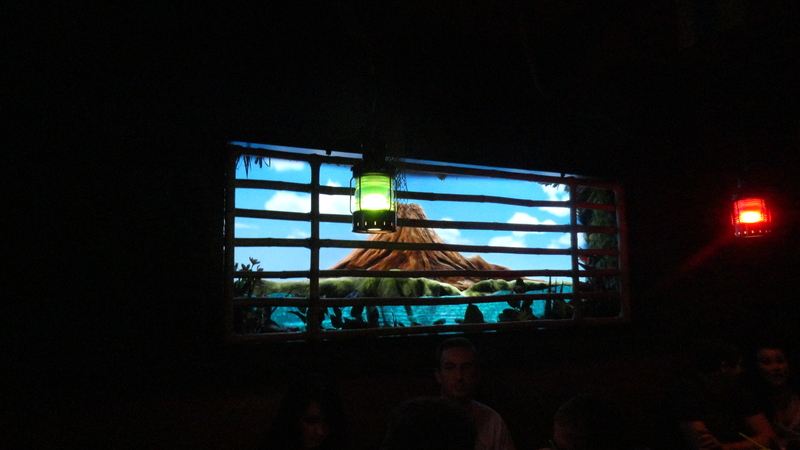 We also spent time on Trader Sam’s Tiki Terrace Outside, I’ll be sure to make a separate post for those photos and information. Overall, I liked the new bar. Seating is very limited, they do not give you an assigned seat, once you get paged, you are set loose to find your own seats. So, we ended up at the bar – at the only seats available – which wasn’t that comfortable. Ideally, I would want to sit at a table. It was so crowded, I didn’t feel comfortable to take a look around the place and see all the details. I didn’t feel comfortable to sit and stay a while. It was like a pseudo frat party atmosphere, lots of yelling and hype – like you would expect from out of control spring-breakers, which I don’t find appealing. Some people were standing because there wasn’t room to sit. We’ll probably be back in two weeks to check it out again, maybe the craziness will have died down by then. We love our souvenir drinking glasses, we’ll probably try a couple different drinks next time. With some luck, maybe we’ll get a table instead. This is definitely a place you will want to see for yourself. 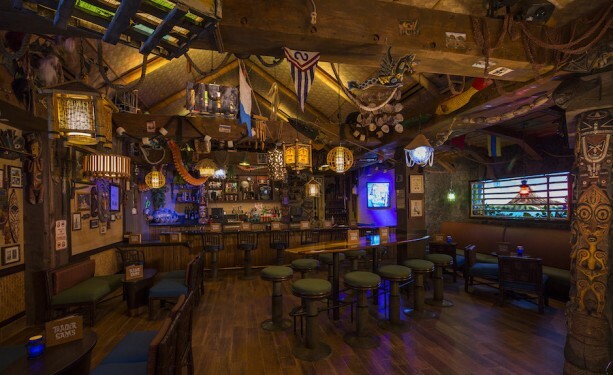 Trader Sam’s Grog Grotto is a brand new bar/lounge at Disney’s Polynesian Village Resort. 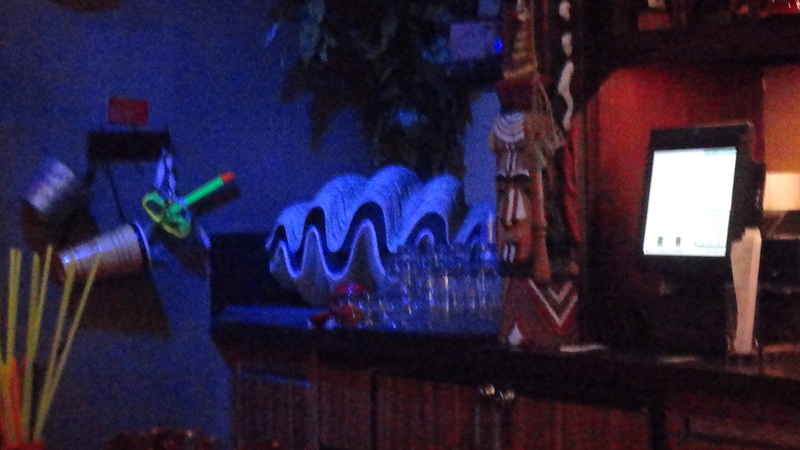 This new bar has a tiki and adventure theme and it looks amazing. 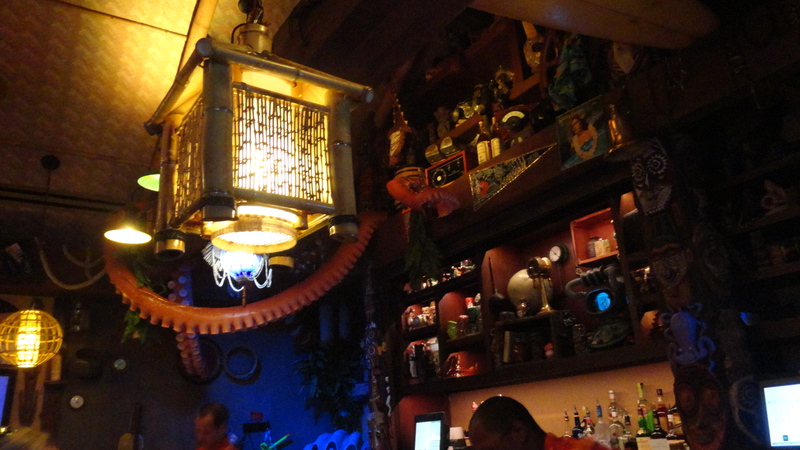 It’s like a cross between the Enchanted Tiki Room & the Adventurer’s Club. I’m so excited to hear that they are having a soft opening this weekend! Officially it will not have it’s grand opening until later in April. 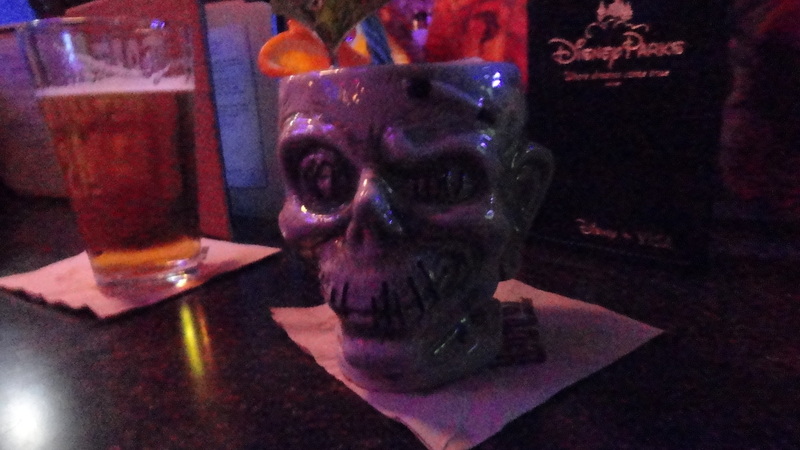 There will be five new alcoholic beverages on the menu unique to Trader Sam’s, four drinks taken from the Trader Sam’s Enchanted Tiki Bar menu (California), plus three non-alcoholic specialties. 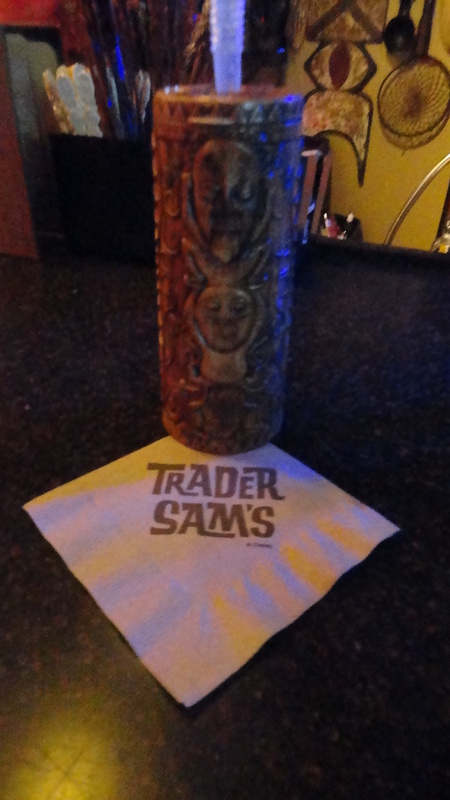 They are going to have custom tiki drinking glasses for purchase, although we may have to wait until the grand opening before those become available. I am really looking forward to sampling the new food and drinks. Kungaloosh!